While working at Tobias & Tobias, a design consultancy based in London, UK, I was just getting my feet wet in UX as a UX Architect Intern. There, I was put with a team of student designers and researchers to create an application dashboard for HR professionals that addressed their daily needs and current pain points. The initial problem was that there was no single service that combined all HR needs into a single affordable, easy to use program. 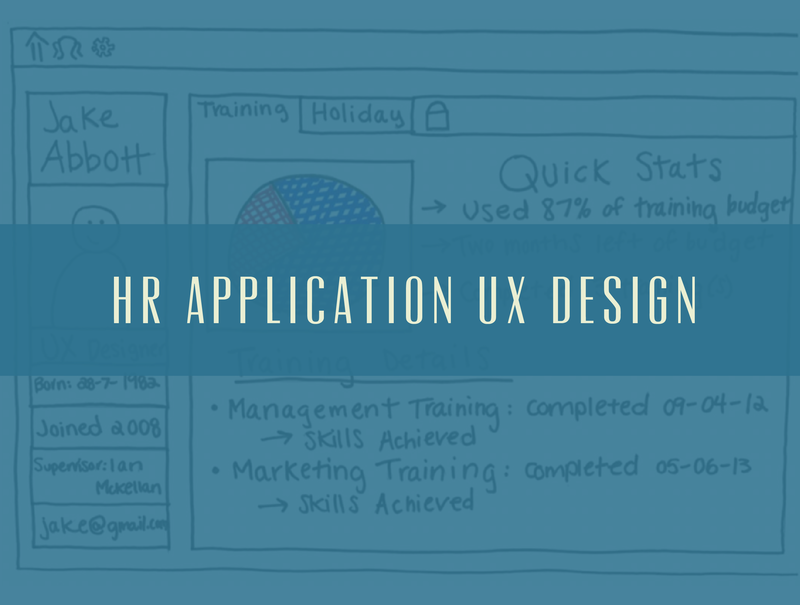 Our goals for this task were, therefore, to design an HR solution that was simple, comprehensive, and intuitive to use, with a focus on using visual representations of concepts to facilitate communication of mass amounts of information. Beyond that, we knew that it needed to be simple, smart, and secure. In its simplicity, our system would have information at the ready for managers to consult to increase workflow within the company. It would be smart in its communicative design: it would not only link and integrate other applications, but it would also listen and respond to these tools to create a better workflow. And it would be secure in that only the appropriate users would be able to see confidential or private information. We had two weeks to research, ideate, and present out findings and wireframes to the entire company. Being new to UX, I had no idea where to start to even fathom what should go into this product, but after talking and discussing more of the design process with our mentors and stakeholders, they suggested coming up with multiple research methods and approaches. Our research approach was simple: talk to people, see what’s out there, test, document, document, and… document. 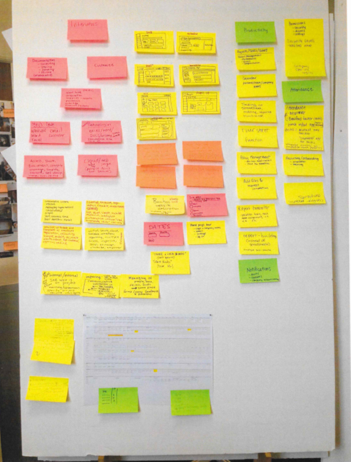 After each phase, interview, or analysis was completed, we added sticky notes to our “ideas board,” which helped us ideate and collect our ideas after research was completed. My team and I knew we needed to talk to the people who we might want to use the app, and see what kind of pain points they have, processes they have set up, and company information that might benefit our designs. We set up interviews locally and remotely to get good insight on what people are currently working with as HR professionals. Each interview was insightful, and through each one, we added more notes to our board. One thing we took away from interviews was that people are having to work with PTO, vacations, and sick days in spreadsheets, paper, or other forms that can be tedious to work with. We found benefit of adding a feature to the dashboard that helped with this process. Another approach was a competitive analysis. We looked at current HR platforms and compared what they current service, what type of design pros they might bring to the table, and room for improvement for some approaches (that we could implement in our product). This turned out useful ebacuse not only were we able to create a product that improves upon current products, but understand jargon, navigation schemes, and the HR tech scene a lot more. Small businesses need an HR solution that links all facets of the company to listen and respond to increase understanding. This is because current workflows are often repetitive and confusing, with little communication between different tasks and programs with no way to quickly and easily view the entire process. Finally, after ideating and designing initial wireframes, we tested our processes out via paper prototyping to make sure there weren’t any initial usability issues, but also get feedback on the product and the interaction someone can have with the product. This helped us flesh out our wireframes a lot more and discuss with the company after we presented. The final product was a set of wireframes that set up a workflow that an HR professional at a small or large company might use to track employee information, such as health benefits, vacation, teams, and current projects. We attempted to combine a lot of the applications and workflows that administrators or HR representatives currently work with, but make them able to interact with each other, so when visiting the dashboard, they can complete many tasks and workflows in the same product, instead of having to mix and match using applications and such that don’t always work well with each other or take up a lot of time. As a team, we were proud with what we made, because even though the end deliverable wasn’t a “pretty” prototype, we had well-thought-out processes and product pages that the design team at T&T could work with down the road. 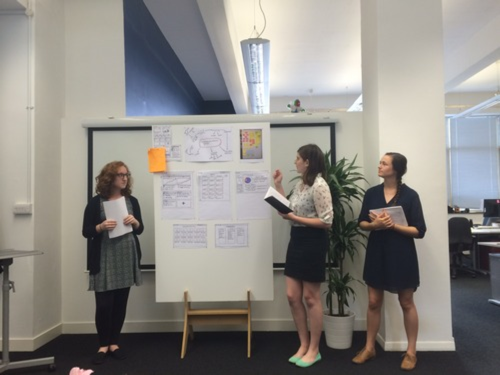 We presented our research findings and wireframes to the entire company at the end of the project. There, we were asked about other workflows, different approaches, or different applications of the product that might benefit other groups of professionals or other workflows of HR professionals. I learned so much through creating this app. Not only was I able to replicate this design thinking process in almost every project in my professional work, but I was able to fully appreciate every facet of the design process. I learned that when creating interventions that real people use, it’s crucial to talk to people, observe, talk more, compare, and test. Just designing cool features or products based around a cool idea might seem good, but learning what the real people using it need, want, and find useful so their workflows and lives are improved, is crucial.